Have Your Animal Totems Been Going Nuts? Is it just me or have the animal spirits really been going out of their way to reach us with their messages? I've always had a lot of contact with animal totems, especially the ones close to me, like Raven and Eagle, but it seems to me that these days they are really going nuts! For instance, the other day I was out gathering wood and a brilliantly-colored Red Fox strolled right by the woodpile. He stopped, turned and looked at me for a minute, before casually strolling off. A few days later I watched in fascination as a Bald Eagle played with a Raven. These are not typical playmates. Finally, this morning, a tiny, tiny spider crawled repeatedly all over my computer as I tried to write. At first, I put up with her meanderings, then I tried to gently remove from my computer and put her elsewhere on my desk. She kept coming back until I stopped to ponder her message. Spider carries many messages, but her message for me had to do with creativity, as Spider represents the energy of creative force. Her message was for me to be creative in finding alternatives to a current impasse in my life ... and to never forget that I can ALWAYS start a new phase in my life, much as Spider weaves a new web frequently. "In your action, you lose sight of the vision, you lose sight of your trust in the process, and you just bang around in your sense of futility ... Hold the vision and trust the process." Suddenly, everything fit together! I realized that instead of being resourceful and creative like the Spider, I was spending a lot of time "banging around," as it were. I was making a lot of noise but not getting very far. I needed to be cunning like the Fox, and use magic like the Raven. And Eagle? 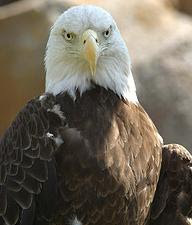 Eagle was reminding me to take heart and be courageous in the face of spiritual tests. Wow, what a message from all of these animal totems. What Are Your Animal Totems Saying To You? 2. Consult a book, like "Animal Speak"
5. Learn to communicate directly with animals and totems with our Animal Communication Ebook. Hope these resources give you a "leg up" when the animal totems start showing up everywhere. Magic is speeding up all around the globe and we need to be more aware, more conscious than ever. To that end, animal totems, angels, guides, and other spiritual beings are upping the ante on their messages to us. So listen up ... or be prepared for that universal two-by-four to come swinging at you, repeatedly! But most of all, enjoy and be appreciative of those spirit guides. They love us, support us, and help us as much as we allow them to. Feel lucky, even if you do get hit by a spiritual two-by-four because a lot of people are not able to make use of this kind of guidance, and suffer all the more because of it. Voodoo magic often uses simulacra magic, or the magic of using objects with a "likeness" to something in the outer world, to create an effect in the outer world. For instance, one magical practitioner took revenge on another by "keying" a figurine to that person, and then shipping the figurine around the world on a slow ship. Needless to say, the victim of the voodoo magic spell was nauseous and dizzy for about a month (the length of the voyage). This is an example of an effective voodoo style magic spell. In the case of simulacra magic, as in the use of voodoo dolls, many magical practitioners fail achieve strong results. Then they think that voodoo magic doesn't work. Not so. However, there are reasons that simulacra magic does not work as well as it should. Normally, there are three reasons that simulacra magic doesn't produce as strong a result as it should. As the name implies, simulacra magic means that the object used in the spell should be as "similar" as possible to the object of the spell. If, for instance, you are going to use a simulacrum in a map spell, to move a naughty neighbor out of your area, then your best bet is to choose a "voodoo doll" that is as similar to your neighbor in looks and personality as possible. If your neighbor is tall, gaunt, and hunched, then look for a figurine that is tall, gaunt, and hunched over. A short fat figurine won't work, nor will a ballerina figurine. It always amazes me how many people pick any old figurine to use for a voodoo spell. If you want to cast stronger voodoo spells, be very specific about the object used as the simulacrum. "Keying" is the magical process by which you connect the object of a simulacra spell to the object it represents in the real world. For instance, in the case of the map spell, keying is the process by which you connect the figurine to your naughty neighbor. Assuming that you have chosen a figurine that closely matches your neighbor in looks and personality, you next must be sure that the figurine is made of a material that will hold the "key," or connection to the real world person. Materials such as wood, metal, glass, and ceramic work well. Plastic, rubber, and modern composites tend not to hold a key. 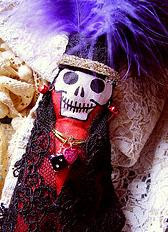 If you want to cast stronger voodoo spells, make sure your voodoo doll or object is made of the right materials. For most simple voodoo magic spells, you can key a figurine just by holding it in your dominant hand and flowing energy into the object as you think about the person. Once the object feels warm and tingly, it is keyed. Just be careful: once keyed, whatever you do to the object you do to the person and you are karmically responsible! Read about Rules of the Road on our website for more information about the universal laws that govern magical practice. Cleansing a simulacrum is very important prior to use in spellwork, especially if the object is not new. Objects pick up vibrations and energy when they are handled, so you want to cleanse these from the object before using it in your spell. A basic four-element cleansing with a firebowl and chalice usually does the trick (learn how to do basic cleansing with out Firebowl and Chalice ebooks). Once an object is cleansed, it's ready for use in spellwork, and you avoid any "side bands" that might have been generated from previous handling of the object. "Take your time, think it through, and do it right!" Fear, despair, and uncertainty ... that certainly captures the nature of the times for many people. And into the breach comes ... flower essences! Flower essences are true magic, as well as wonderful gifts from the Earth. Dating back to ancient Lemurian times, flower essences are vibrational wonders that can uplift the spirit, heal the body, and bring hope to a weary soul! If you feel fearful, uncertain, or depressed, here are some wonderful flower essences that can really help. They really are magical in the effects they can create. - Rock Rose-for dauntless courage. Gift: courage, strength of character. - Chamomile-nervousness, anxiety. Gift: calming, relaxing. - Mimulus-long time fears, extremes, dominated. Gift: fearless, confident. - Cherry Plum-loss of control, vicious, to remain in control. Gift: calm, quiet, in control. - Aspen-spooky, impending harm. Gift: connected, fearless. - Red Chestnut-worry. Gift: positive, calm. - Crab Apple-cleansing toxins, physical and emotional. Gift: cleansing toxins, emotional/ physical. - Willow-resentment. Gift: optimistic, responsible, acceptance. - Sweet Chestnut-despairing, burned out. Gift: faith, trust. - Pine-rejection, abuse, guilt, never succeeding. Gift: responsible, humble. - Oak-chronic exhaustion, overworked but keeps struggling. Gift: strong, dependable. - Star of Bethlehem-any kind of trauma or loss of a loved one, gives comfort. Gift: comforts all traumas. - Scleranthus-neurological confusion. Gift: balanced. - Cerato-mentally flighty, difficulty focusing. Gift: certain, strong. - Gorse-hopelessness, giving up. Gift: faith, hope, positive. - Wild Oat-bored, feeling un-useful. Gift: talents, feeling useful, definite character. - Gentian-set backs, disappointment. Gift: restores hope, long illness rehabilitation. - Hornbeam-weariness. Gift: certain, lots of energy. You can take single flower essences or you can mix them together. The effects are powerful either way. To make your own formula, mix spring water with alcohol (like brandy) in an ounce dropper bottle, then add 4 drops of each chosen flower essence, which you can purchase in most health food stores. You can either take the mixture from the dropper bottle 3 to 4 times a day, or, for longer effects, add 4 drops of the mixture to a bottle of spring water and sip the water all day long. Adding flower essences to bathwater is also effective, not to mention pleasant. The length of time you take flower essences is a very individual decision. You can take them for as long as they provide relief, or until you feel a shift inside yourself. At that point, you may wish to stop taking the essence, and take some time to integrate those changes. Alternatively, you can switch to a new flower essence formula if you feel that a change is called for. To learn more about flower remedies, how to use them, and how to make them, check out the ebook "Energy Healing for Self and Others" in our online store. The ebook details not only flower essences, but a number of magical and natural healing techniques including the use of herbs, aromatherapy, meditations with sound, and the use of color. Enjoy!